US DoD 1999 Forecast: "Pakistan Disappears By 2015"
Asia 2025, a US Defense Department Study produced in summer of 1999, forecast that Pakistan would "disappear" as an independent state by 2015. It further forecast that Pakistan would become part of a "South Asian Superstate" controlled by India as a "regional hegemon". Two Indian-American "South Asia experts" contributed to this study. 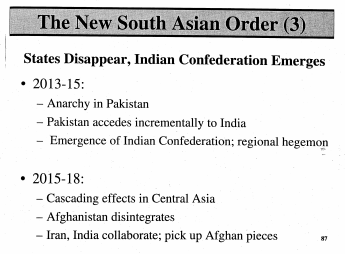 Much of the forecast in its "New South Asian Order" section appears to be wishful thinking of its Indian contributors. 1. Pakistan is "near collapse" in 2010 while India is making "broad progress". 2. Iranian "moderation" in 2010 while Afghanistan remains "anarchic hotbed". 3. Pakistan is "paralyzed" after an "Indo-Pak war 2012". 4. US launches conventional strike on "remaining Pakistan nukes" after the "Indo-Pak war 2012. 5. China "blinks at US-India Collusion". The list of people who contributed to this study included two Indian-Americans: Ashley Tellis and Rajan Memon. Both of these gentlemen are considered "leading South Asia experts" in the United States. Much of the forecast in "New South Asia Order" appears to be wishful thinking of these two Indian-American contributors. Ashley J. Tellis is now a senior fellow at the Carnegie Endowment for International Peace specializing in international security, defense, and Asian strategic issues. He was with the US government think tank RAND Corp at the time the Asia 2025 report was written. Rajan Menon is currently professor of political science at the City University of New York. He was teaching at Lehigh University back in 1999. Western and Indian forecasts of Pakistan's collapse are not new. Lord Mountbatten, the British Viceroy of India who oversaw the partition agreed with the assessment of Pakistan made by India's leaders when he described Pakistan as a "Nissen hut" or a "temporary tent" in a conversation with Jawarhar Lal Nehru. Here's the exact quote from Mountbatten: "administratively it [wa]s the difference between putting up a permanent building, a nissen hut or a tent. As far as Pakistan is concerned we are putting up a tent. We can do no more." The Brits and the Hindu leadership of India both fully expected Pakistan to fold soon after partition. Many western analysts have forecast Pakistan's demise as Pakistan struggles to deal with terrorism at home. Among them is former President George W. Bush's adviser David Kilcullen. "We're now reaching the point where within one to six months we could see the collapse of the Pakistani state, also because of the global financial crisis, which just exacerbates all these problems. . . . The collapse of Pakistan, al-Qaeda acquiring nuclear weapons, an extremist takeover -- that would dwarf everything we've seen in the war on terror today", said Bush Iraq adviser, David Kilcullen, on the eve of Pakistan Day in 2009 commemorating Pakistan Resolution of 1940 that started the Pakistan Movement leading to the creation of the nation on August 14, 1947. Kilcullen is not alone in the belief that Pakistani state is in danger of collapse. Others, such as Shahan Mufti of the Global Post, argued in 2009 that Pakistan is dying a slow death with each act of terrorism on its soil. Pakistan has defied many dire forecasts of doom and gloom since its birth. Some Indian and western writers and journalists present caricatures of Pakistan that bear no resemblance to reality. They portray Pakistan as a artificial and deeply divided failed state. What they fail to see is Pakistan is not one or two dimensional; it's much more complex as explained by Christophe Jaffrelot in his book "The Pakistan Paradox: Instability and Resilience". Political, military, religious, ethnic, sectarian, secular, conservative and liberal forces are constantly pushing and pulling to destabilize it but Pakistan remains resilient with its strong nationalism that has evolved after 1971. Pakistan is neither a delusion nor owned by mullahs or military as claimed by some of Pakistan's detractors. "..unlike numerous other emerging nations, particularly in Africa, the Idea of Pakistan has repeatedly trumped fissiparous tendencies, especially since Pakistan assumed its present form in 1971. And its institutions have withstood repeated buffeting that almost anywhere elsewhere would have resulted in the State crumbling. Despite numerous dire forecasts of imminently proving to be a "failed state", Pakistan has survived, bouncing back every now and then as a recognizable democracy with a popularly elected civilian government, the military in the wings but politics very much centre-stage, linguistic and regional groups pulling and pushing, sectarian factions murdering each other, but the Government of Pakistan remaining in charge, and the military stepping in to rescue the nation from chaos every time Pakistan appeared on the knife's edge. The disintegration of Pakistan has been predicted often enough, most passionately now that internally-generated terrorism and externally sponsored religious extremism are consistently taking on the state to the point that the army is so engaged in full-time and full-scale operations in the north-west of the country bordering Afghanistan that some 40,000 lives have been lost in the battle against fanaticism and insurgency". 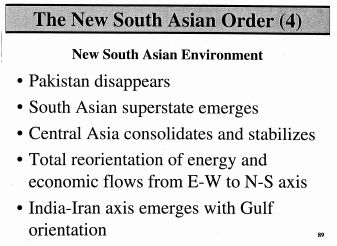 A 1999 US Defense Department study titled "Asia 2025" forecast Pakistan's collapse by 2015. It further said that Pakistan would become part of a "South Asian Superstate" controlled by India as a "regional hegemon". Two of the study's contributors were "South Asia experts" of Indian origin. Much of the South Asia section of this study appears to be wishful thinking rather than serious analysis. Resilient Pakistan has defied this and many other similar forecasts of its demise since its birth.